Battlefield 3 was one of my most anticipated games of this fall. It is the latest iteration in a long-line of beloved shooters from a team of developers who know what they're doing, but I also love a good fight. I'm not just talking about the endless gun battles you get into in the game. I'm talking about the tooth-and-nail brawl that pits Battlefield against Call of Duty. Things tend to get better when two developers are trying to be the best at something. So how did it work out for Battlefield 3? Brian Crecente, who will be reviewing the game and has played through a chunk of the campaign and online: Battlefield 3's multiplayer is as good as its single-player campaign is bad. Dropping into an online match of Battlefield 3, on computer or Xbox 360, is a bewildering first-time experience. I've played all of the Battlefield games, all of the Call of Duty games. First-person shooters are my football, my baseball, my basketball. This is what I play when I want to kill a little time in the evening or relax with a beer. So I'm not new to the different forms an online match can take in a military shooter, but falling into a match of Battlefield 3 is still awe-inspiring, distracting, immersive. The game's use of sound, its massive battlefields, the disintegrating cover, the vehicles, the push to get players to act in concert, all combine with a new level of graphical detail and smartly sharpened leveling up and unlock system that delivers the deepest play experience I've ever had in an online shooter. This is the new bar for online first-person shooters, when it works. Launch day jitters hit my PC matches with some dropped play and an occasional bungee run back and forth on a couple of maps. The Xbox 360, after valiantly delivering mostly fault-free gameplay for a half a day, just gave up. The developers later said they were investigating server outages. Where does sublime online multiplayer leave Battlefield 3's campaign? At the other end of the spectrum. I've played through maybe a third of the campaign so far, so it's possible that the game will shape up by the time I've finished it and I'm writing my full review next week, but I doubt it. Battlefield 3's story is a confused hodge-podge of events that still hasn't delivered a single spectacular scene. I don't mind a game leading me by the hand, but it needs to take me somewhere, and this one hasn't yet. Worse still, the Xbox 360 version of the game shows significant slow down during key firefights. I'm not sure why the game stutters and slows, but I suspect it has to do with the destructible environment, something that's a nice touch but isn't worth the cost if that's what is causing this problem. Evan Narcisse, the guy who's spent chunks of time with Battlefield 3 in researching an article for Time Magazine: I've always hated the argument that multiplayer makes up the main portion of the modern-day FPS experience. Mind you, I recognize that it's become more true in recent years but I dislike the thinking that's led to single-player campaigns that have so obviously been given short shrift. Yet, my time with Battlefield 3 just backs that notion up in spades. In the run-up to the game's launch, it seemed like DICE was putting as much effort in crafting a single-player game that would fold in some of the lesson they learned from their multiplayer successes. They specifically talked about creating moments of surprise for the solo portion of BF3 but that's exactly what it's lacked to me so far. However, surprises abound in the multiplayer. Whether it's the big ones of building falling on people or tank-vs.-jet skirmishes or the little ones of how interconnected the assist and XP systems feel, the times I've stepped into BF3's online conflict have left me blown away. So, my thinking is if you keep expectations low and think of single-player as a training ground, Battlefield 3 is a must-play game. Yes. 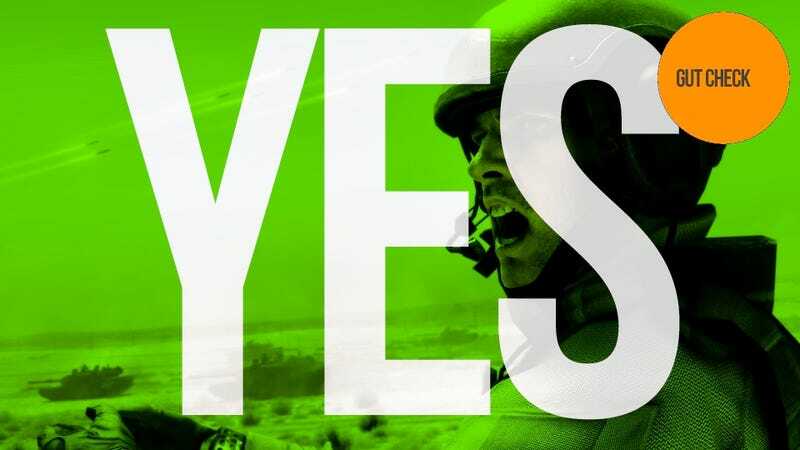 Luke Plunkett, who has played a ton of the game at events, but waits patiently for Battlefield 3's Australian release: I'm giving it a conditional yes. A half-assed response, maybe, but this seems a half-assed game. Battlefield 3 is a multiplayer game. If you want to buy something to shoot at people over the internet, this is it, especially if you own a decent PC. If you value a blockbuster singleplayer campaign as much as multiplayer, though, you may be slightly disappointed, as what I've seen and played of Battlefield 3's seems a little bland.Yes.